At a Maryville basketball game, students fill the stands to cheer on the Saints and enjoy the fast-paced, fan-filled environment. Behind all the cheering fans lies Maryville’s pep band, supporting every game with their music. 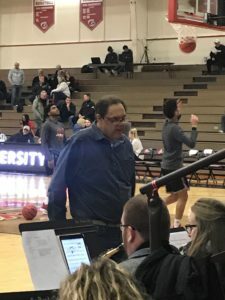 Directed by Eddie Carr, the pep band is officially known as “Sound of the Saints.” They play during home games throughout Maryville’s basketball season, as well as during the annual “Moonlight Madness” event during family weekend in October. The band consists of three major sections; the rhythm section (drums, piano, bass, guitar, and mallet instruments), the woodwinds section (saxophones and clarinets), and the brass section (trumpets and trombones) Meeting in the auditorium on Monday nights, the pep band is open to any student at Maryville, regardless of their major. Along with the joy that playing music brings the members of pep band, there is another factor that makes it worthwhile for these kids. 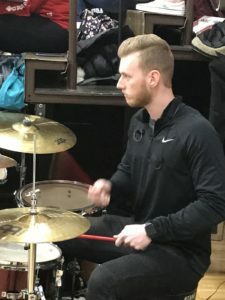 “I was interested because it was an activity that was on campus, but also because of the scholarships; you can get paid,” said Hannah Jo Forbes, who plays bass guitar. For the students who choose to do the pep band scholarship, $2000.00 a year comes with it. This scholarship lasts through all four years of college. The pep band will play at six more home basketball games this season, including both the men’s and women’s games February 21, at Maryville’s annual 1000 Saints night. Pep band season ends just after the basketball season does, as they do not play at tournament games, only during the regular season. This group appears to have a bright future ahead of them, as more new musicians join each year. For Eddie Carr and the Sound of the Saints, the fun has just begun. To join pep band, email Eddie Carr at ecarr@maryville.edu.